We had a thunderstorm yesterday. I didn’t think to take any pictures during the storm, but here are remains on the grill. The grill has happily been getting much use lately, another sign of the season. 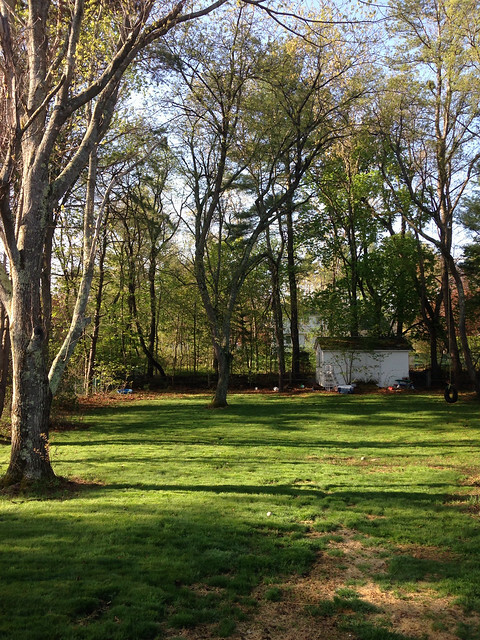 I mowed the lawn for the first time this year yesterday as well (before the storm, thankfully!) and the trees are finally starting to leaf out. 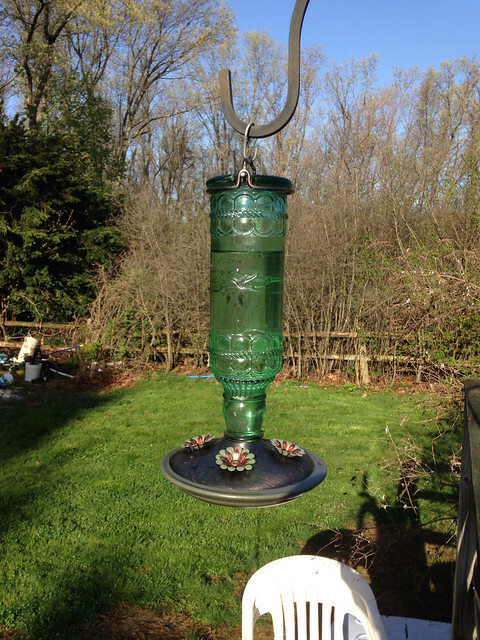 I made hummingbird food and hung the feeder. I’m not 100% positive, but I think I saw a hummingbird speed by my window a couple days ago, so it seemed like time to get it out there. Some of the very few lilacs I seem to have this year are opening up. Remember in this post I lamented not seeing lilac buds yet? I was mistaken. There are very few buds out there to be seen. I think this harsh winter unfortunately did a number on lilacs around here. 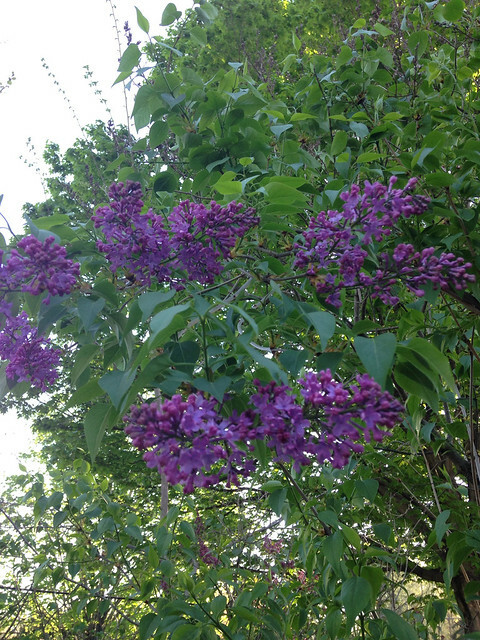 Lilac trees line the side of my driveway and I have several more trees around my house and there are precious few buds and many dead looking branches. My neighbor’s shrubs seem to be suffering the same fate. Anyone else in the northern climes noticing anything like this? Hubby got me a new birdbath for my little perennial garden. 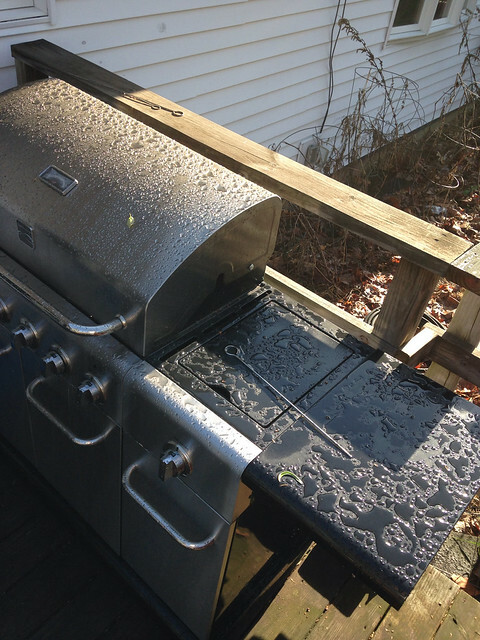 My old one broke in the winter – my own fault for forgetting to put it away. I love this shiny new one though. It will hold more water and add a nice touch of color to the yard. To all the mothers out there, including mine, I hope you are having a wonderful Mothers Day. I’m planning to spend mine having a little brunch with my family (I enjoyed the Easter one so much I decided to have a similar one today), which I am going to start working on soon, then I’m hoping to soak up a bit of sun and Vitamin D, (forecast here is for sunny skies and 75 degrees) and perhaps do a bit of shopping with my home-from-college girl. Even though I’ll cook most of the brunch food myself, my daughters have promised to clean up! That’s a good Mothers Day treat. Your new birdbath is awesome! That is the prettiest one I have ever seen! And, your lilacs..beautiful! I still have 1 1/2 buds..no flowers for a while. Your plans for the afternoon sound great! It is actually nice here too after a night of heavy rain. Planning two walks today..had breakfast at Blue Rock! Thanks Joanne. I hope you had a lovely Mother’s Day. I love this time of year. After the winter that was, any and all signs of spring are welcome! Hello Karma et merci pour ce joli moment que tu nous fais vivre dans ton jardin. J’aime les dessins de la pluie sur ton grill, la ravissante fontaine pour les oiseaux et la couleur de ton lilas. Le mien est en fleurs aussi. J’espère que ta journée a été belle et chaleureuse et que ta semaine continuera dans le même esprit. 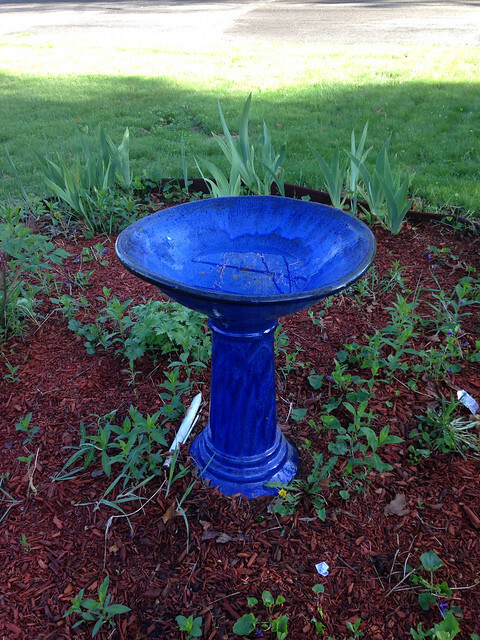 The blue of your birdbath is stunning. I like it. We are having signs of spring, too, although it looks like you are much ahead of us. But it’s supposed to be almost 70 today, so I am beyond thrilled. Thanks Kathy! So nice to see you here!